Can you believe I am 35 and I just stepped foot into El Capitan Theatre? I had the pleasure of covering the opening of Ralph Breaks the Internet at the El Capitan Theatre in Hollywood. Beside the movie being awesome (so awesome that we ended up taking dada to watch it again two days later), watching it at El Capitan was magical! Like one of the employees said, “It’s the best place to watch Disney movies.” Yes, that is correct. I was in awe by the experience and so thrilled to introduce this experience to my boys. We are beginning a new tradition with our kids – taking them to see the opening of Disney movies here at El Capitan the night before the official release date. If you choose to attend the evening before the official opening day tickets are available to the public. The ticket fee is so worth it because you get the following: popcorn and drinks, movie swag character meet and greet, photo opps with backdrops, and special performances! We are Disneyland Annual Pass Holders so I have had my share of Disney magic and I felt the same way during this event. So what gives it a magical ambiance? First off, the employees make this place feel warm and inviting. From the moment I stepped foot, they were personable and accommodating to my toddlers’ needs. I asked them if they are always this way or just because we were at a special screening, and they said ALWAYS!! The theatre design is beautiful! For every new Disney film, the interior is designed to fit the current movie. There are activities to participate in and set pieces included in the hallway. For example, with Ralph Breaks the Internet the Sugar Rush game is available for you to pretend to play! There’s a touch of Disneyland such as the Mickey pretzels, character popcorn buckets, super friendly cast members, and Disney Studio Store attached to the theatre. I loved that there’s a Ghirardelli Soda Fountain and Disney Studio Store with specific movie merchandise attached to the theatre. How cute is the swag? Our popcorn buckets are being used to store our mini figurines and art supplies. What sets El Capitan different from other theatre? There are BOOSTER SEATS for our littles!! Yes, that is right there is no more falling in between the seats or standing up because they can’t see. This is a game changer because they actually sat throughout the whole movie without wiggling around. They have a cell phone charging station for adults! There are activity sheets to entertain the littles and a movie backdrop to take pictures with. The kids loved the concession food! We had mini corn dogs, pizza and popcorn and everything was consumed by a 2 and 4 year old. And if your order isn’t available it will be delivered to your seat. Say again? Yes, that was my response. There’s a specific area for stroller parking! 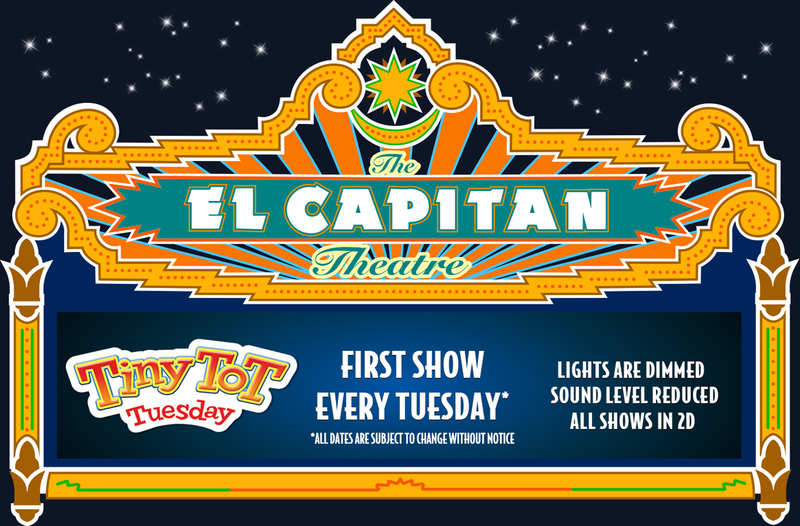 They love our tots so much that they offer Tiny Tot Tuesdays – special accommodations like dim lighting and sound level reduced so you can watch movies with your toddlers! Want to host a kids party? You can use El Capitan as a venue! There’s a room downstairs for hosting parties. Ticket fees: prices vary depending if you choose to attend the special event premieres or the packages – VIP (popcorn, souvenir, drink) is $26, regular tickets for adults $18 ($15 Monday-Thursday before 6pm), children 3-11 and seniors are $13. Children 2 and under are free but must be seated on a lap. Parking: Hollywood and Highland parking lot is directly across the street and safe. I entered using the address: 1755 N Highland Ave, Hollywood, CA 90028 and it was easy!!! I went to the first floor and followed the path to the Dolby Theatre that led me out directly in front of the El Capitan Theatre. I was there for 5 hours and paid $10 with validation. The validation box is to the right of the entrance to the Disney Studio Store. Restrooms: There are restrooms located on both floors of the theatre so very easy to get to if you have a last minute potty request. Stroller accessibility: Absolutely! There’s no shame in the stroller game! There’s a designated area for stroller parking.